“Wilderness Voices” from Christian Faith Publishing author Martha McKown is a collection of poetry that explores life. Based on the author’s extensive experiences, the poetry within the pages of “Wildness Voices” covers a broad range of subject matter. “Wilderness Voices”: a collection of poetry inspired by life on a Kentucky farm and a life of world travel. 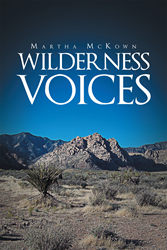 “Wilderness Voices” is the creation of published author, Martha McKown, an ordained United Methodist minister with graduate degrees in Religious Education and Divinity. Martha McKown was inspired as a very young child when her older sisters studied High School literature. She loved the early English folk ballads, especially “Barbara Allen” and “Lord Randal.” Her first book was Robert Lewis Stevenson's “A Child's Garden of Verses.” She participated in area writers' groups and three courses from the Institute of Children's Literature. In addition to writing poetry, she leads several poetry groups. As a speaker, she presents her appreciation of the great poets and her adventures with poetry and verse. Rev. McKown's poems have been published in newspapers and magazines, but this is her first book of poetry and verse. “The title, ‘Wilderness Voices,’ comes from Isaiah: ‘In the wilderness prepare the way of the Lord, make straight in the desert a highway for our God.’ As a youth the writer answered her call as Isaiah did, ‘Here am I; send me!’ Her direction in life and her poetry are her response to God's call.” --Martha McKown. Published by Christian Faith Publishing, Martha McKown’s new book is a collection of poetry based on the author’s experiences. “Wilderness Voices” presents poems born from many different thoughts, experiences and relationships. Some poems are comical retellings of humorous incidents. Some simply explore various people, happenings, and natural phenomenon. Storms and "groanings" of creation are given colorful attention. Many poems started as experiences from the writers' childhood on a Kentucky farm. Life and death are inspected and celebrated. There are musings on the questions about illness and the experience of aging. War and active, but innocent, warriors tie the now with the past. Rows of tobacco and quiet inspire the sadness and pathos of conflict for Mrs. McKown. View a synopsis of “Wilderness Voices” on YouTube. Consumers can purchase “Wilderness Voices” at traditional brick & mortar bookstores, or online at Amazon.com, Apple iTunes store, Kobo or Barnes and Noble. For additional information or inquiries about “Wilderness Voices,” contact the Christian Faith Publishing media department at 866-554-0919.